For all practical purposes, Amitabh Bachchan was THE biggest star in Bollywood from the early 70's (beginning with 'Zanjeer') right up until the early 80's. I remember going to movies in the theater in India as well as renting them in the US on that antiquated medium VHS and the general rule was that if it was an Amitabh movie - you just rented it, no questions asked. And for a good while the Big B delivered and did so with an amazing run of blockbuster after blockbuster. The runaway hit train careened off the tracks when he got hurt on the set of 'Coolie' - the news of which not only brought India to a halt but was covered on '60 Minutes'. His career lurched forward while he recovered with some movies that were sitting in production for awhile but then came 'Gangaa Jamunaa Saraswathi' and with it the Amitabh Bachchan party finally shut down for good. And although it would start up a few years later with 'Major Saab', it would never quite be the same. The unthinkable happened in the Indian community with 'GJS' - a general feeling that Amitabh was done, that his movies were bekaar and for a true old-school Amitabh fan it was (with apologies to Don McClean) - the day the music died. 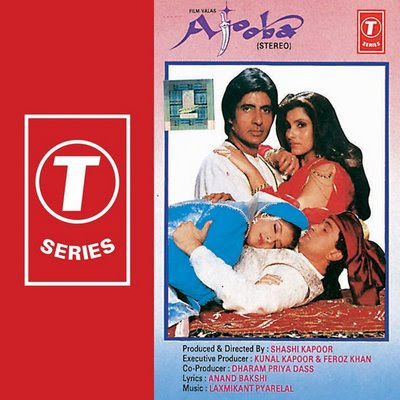 'Ajooba' came along during that dark time and although some bad Bollywood movies are so bad that they are actually good, this one I just remember as being bad. I am sure that if I saw it again today it might be different but the memories of seeing my favorite actor reduced to playing a mythical hero donning an aluminum foil Mardi Gras mask were just too painful. Amitabh was rumoured to have done it gratis for his buddy Shashi Kapoor's debut as a director and the movie turned out to be his only directorial venture (thank goodness). The movie was apparently co-directed by a Russian film director and according to IMDB it was released in Russia a full three years prior to it's release in India. 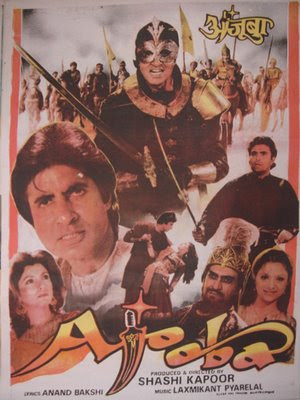 Shashi produced the entire thing and his son Kunal as well as the actor Feroz Khan served as executive producers. Alas, even an all star cast consisting of Dimple Kapadia, Rishi Kapoor, Shammi Kapoor and Amrish Puri could not save this movie from being one of the costliest train wrecks in Bollywood history. But maybe I have too much emotional baggage attached to this movie and thus encourage you to check it out for yourself. Our friend Beth from Beth Loves Bollywood did and from the looks of it had a grand old time. Hmm...don't know if I'll be checking this one out anytime soon...not sure I'm at the same level of appreciation (yet) with this stuff as Beth so lovingly is! Thank you for the info on Amitabh...I watched a movie called "Hum" with BB in it, and thought that one awful...do you know where it fell in terms of this chronology? So I conclude from your post that you won't be rewatching it either anytime soon? The late 80s and early 90s were certainly dark days for Big B fans. As one who grew up in those days my first memories of him are from those terrible movies (Indian TV rarely showed his blockbusters and I didnt get to see most of them till a few years ago) and I am afraid my love of Big B has always been tainted by memories of Akayla, Mard, Khuda Gawah, etc. In retrospect Ajooba was probably better than those! As Beth suggests on her Ajooba post, we should have a global watchalong to help each other through these difficult movies!!!! I agree with Beth and Bollyviewer on the watchalong idea AND would probably get a kick out of this if I had you guys to laugh at it with, even if only online (I suppose I could always watch this with my brother--he appreciates my love for Bollywood and sat through Hum Aapke Hain Kaun with me in its entirety without complaining). Nida - These masala movies are an acquired taste - 'Hum' was close to unwatchable. There are several AB movies released around that time that I would stay away from: Gunga Jamuna Saraswati, Toofan, Shahensha & Jaadugar. Although the 'Chumma De' song from Hum is quite catchy and was a pretty big hit. Shweta - I have been wracking my brain trying to figure out why I just love some insane masala movies yet find others unwatchables. After much contemplation I came up with Doc Bollywood's three requirements for a great masala flick: 1. Lots of stars 2. Killer outfits 3. Amazing tunes... It's on that third one that 'Ajooba' failed me, I will sit through some serious crap for the tunes (i.e. Hum Kisise Kum Nahin). Bollyviewer - dark days indeed! Try to go back and watch his stuff from the 70's, imho it was when he did the bulk of his best work. Abhimaan, Mili, Kaala Patthar, Sholay, Don, Suhaag & Amar Akbar Anthony. Oooh, I do feel a watchalong coming along and these 70's masala flicks really DO make the best group experiences. The executive Producer Feroz Khan is Not the veteran Film Actor but is renowned Theatre Director.